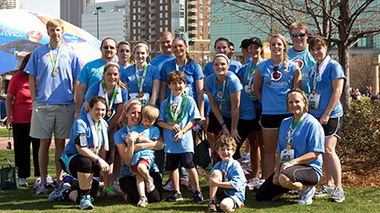 Miles for Cystic Fibrosis is an Atlanta-based organization that helps raise awareness of cystic fibrosis and provides funds to assist CF families, support research for better treatments and a cure. We provide opportunities for exercise for children and adults living with the disease. Cystic fibrosis is an inherited, progressive, life-threatening disease that causes recurring lung infections and limits the ability to breathe. It affects over 30,000 individuals in the United States. In the 1950s, few children with cystic fibrosis lived to attend elementary school. Today, advances in research and medical care have enhanced and extended the lives of children and adults with CF. Many people with the disease can expect now to live into their thirties, forties and beyond. Exercise has been shown to slow the rate of decline in lung function, help clear mucus from the lungs, improve appetite, and build overall endurance in people with Cystic Fibrosis. Not only does exercise strengthen the airways and cardiovascular system, an active lifestyle strengthens the psychological and social connections between physical activity, self-esteem, and health. It is critical that children with CF develop the interest and confidence to be physically active. As more and more individuals with CF are living well into adulthood, healthy and active lifestyles contribute to both physical and mental well-being. Donations will be used to support our BreatheStrong exercise grant program or shared with two charitable organizations vital to the cystic fibrosis community. For more than fifty years the mission of the Cystic Fibrosis Foundation, a nonprofit, donor-supported organization, has been to assure the development of the means to cure and control cystic fibrosis and to improve the quality of life for those with the disease. Click here to go to the site. Families affected by cystic fibrosis have been supported by the Cystic Fibrosis-Reaching Out Foundation since 1999. The Atlanta-based nonprofit organization provides financial support to CF families struggling with the cost of medications, nutritional supplements, utility bills or other necessities to live well and stay healthy. Miles for Cystic Fibrosis works closely with the Reaching Out Foundation and provides funding for its financial assistance program. Click here to go to the site. Funds raised by the Big Peach Sizzler 10K will support Miles for Cystic Fibrosis as we raise awareness for Cystic Fibrosis, provide funding to assist CF families in need, and promote and provide grants for exercise opportunities for children and adults with CF. Owner and Founder, Big Peach Running Co.